I haven't had a watch in 4+ years. Its actually probably been long than that, so long that I can't even remember when the last time I wore a watch was. I desperately needed one but never had the time to go looking for one. J3LL offered a fun solution. 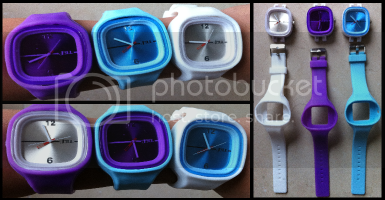 Available in a myriad of colors, these watches are pretty cool and simple to use. There are currently 2 styles: the "Rock", a square-face watch and the "Clock", a smaller round-faced watch. These unisex watches are a fun addition to your outfit and I love how you can mix and match the colors to match your outfit or mood. Its just too easy. Pop out the clock face and attach it into a different silicone color band in a matter of seconds. I love colors and if I could, I would pick every single one of these watches. However, I ended choosing light blue, purple and white. Look at the fun I had! I do have smaller wrists so the watch face was just a tad big on me but at the same time, the soft silicone wrist band was soft and comfortable. Check out all these amazing coupon/discount codes offered. Go to their homepage and like them on facebook to get free shipping, give them a +1 to get $2.50 off, and send out a tweet for another $2.50 off. And because WOS readers are so awesome, here's another code for an extra $5 off (kO4Gi). Isn't that crazy? That's a total of $10 off AND FREE shipping! Buy It: J3LL watches are $24.99 and extra faces/bands are $14.99. Win It: J3LL has been generous enough to offer 1 Whirlwind of Surprises' reader 2 J3LL watches of their choice. Come back to enter the giveaway as part of the Fall Giveaway Festival! Make it easier on yourself by showing the sponsor some love now: Like J3LL on facebook and follow @J3LL. Disclaimer: The product/s mentioned above have been provided by J3LL for the purposes of this review. No other form of compensation was received. Opinions expressed belong to Whirlwind of Surprises and are NOT influenced in any way. Please view my full disclosure. How cool are those watches! I don't wear a watch either, but these are neat! Cute watches. They look like I could use them with the kids and not worry about destroying them. I was just thinking about how long it has been since I had a watch. 1996. These are very cool but I think I will stick with the no watch gig. It's been working for me. Nice giveaway. The purple is my favorite. These watches are so cool. I like the vibrant colours they have to offer. I know my Nieces would love to add them to their jewelry wardrobe and I would wear one too. These are not only cute, but they also look tough, which is awesome. These are so cool looking!!!! I really want one!!!! i love the bright colors that you have to choose from! These are very neat looking. I like the bright colors they come in. These are so adorable! I know my daughter would love these watches as much as I do! These watches are really cool.... I love the colors! These are very cute and unique! I've never seen watches like these around, ever. I'd love to get one! These look like fun! I mean who wouldn't want to have them! I like these watches though I rarely wear one. I like combining the different colors! Very cool! I love the way you can mix and match colors, what fun watches! Really cool watches!!!! I love them! A watch for every outfit how cool is that~! The colors are fun and so many to choose from. Thanks for sharing this review~! so cute! great for stocking stuffers this year! I really like how you can interchange them to look different...your review made me want one even more! Love the colours! cool warches, thanks! I like the variety...very pretty colorful watches. These are really cute and fun and for a good price too! I love how you can mix and match and wow the colors are so vibrant and beautiful! How neat! I love the availability of choices! These watches are 'stylin' love all the colors! These would be great christmas gifts for my nieces! I would definitely wear these. They are really cute, and I always wear a watch whenever I go somewhere. I love that you can change the faces of the watches! I really love the color of these watches and they are a great price! These look like a great new trend and I know my son would absolutely love one!! These are very cute. I like the variety of colors. I'm like you in the fact that I haven't owned/worn a watch in several years! I do, however, like these particular watched and would consider wearing one! I also have not worn a watch for ages but would like to again. It is just not as convenient to pull out my blackberry to check the time. My wrists are small too and the size of the watch face does concern me but I would be willing to sacrifice aesthetics for convenience. These look like really cool watches. Ty for the giveaway. These are pretty cool watches! I really would like to have one of these. I really like that you can mix and match these watches and that some of them are really bright and vibrant while others are a little more subtle. These watches look really fuN!